This is the fourth in a series on a selection of some of the many community gardens in the East Village in Manhattan, New York. Winner’s Circle is now gone. Generation X Cultural Garden at 270 East 4th Street. South side of East 4th Street between Avenues B & C was created in 1971. This Lower East Side space includes Geoblock paving and has a viewing area for multi-media performances. It has a masonry retaining wall created for planting areas where blackberries, blueberries, raspberries and strawberries grow in season. Nectarine, pear, peach and apple trees form a mini urban orchard. All garden furniture and planters are made from recycled materials. Events featuring Greenmarket farmers, Youth market displays, TAiNO arts and crafts, and healthy eating and tasting sessions with international foods saw more than 2,000 local school children from the neighborhood participate. Volunteers do weeding, watering, planting and mulching. This open plot is used for community gatherings. It also has an arbor built with unique hand-carved posts. Secret Garden 293-297 East 4th Street at Avenue C. Founded 1983. The garden produces food and has flowers, shade trees and seating. Garden Size: 2,209 square feet. Created with the help of a Community Development Block Grant. Open Hours Sunday: 12p-5p Saturday: 12p-5p. El Jarden Del Paraiso (El-Jardin-del-Paraiso-NYC on Facebook) El Jardin del Paraiso is a community garden located on 5th Street between Avenues C & D in New York City. A goal of El Jardin del Paraiso is to be a model eco park teaching sustainability and Earth stewardship. We will include permaculture principles, diverse habitats, stormwater resource usage and water purification, soil restoration, renewable energy, preservation of endangered plants, seed saving, cold climate growing techniques, and composting. This garden received a planning grant from GreenAcre for a complete rehabilitation. A landscape architect was hired to redesign the plot and the park has since received an additional GreenAcre grant to implement the plan. Numerous awards and achievements have been bestowed upon El Jardin del Paraiso, including The National Wildlife Award, Molly Parnis Dress Up Your Neighborhood Award and a Youth Garden Grant from the National Gardening Association for the Children’s Garden. Cultural events have included a sculpture exhibition, mask making, children’s films, jazz concerts, puppet making and performances, bicycle workshops, Halloween, Festival of Lights, the Holy Cross Festival, Fathers’ and Mothers’ Day celebrations, and a cook off. 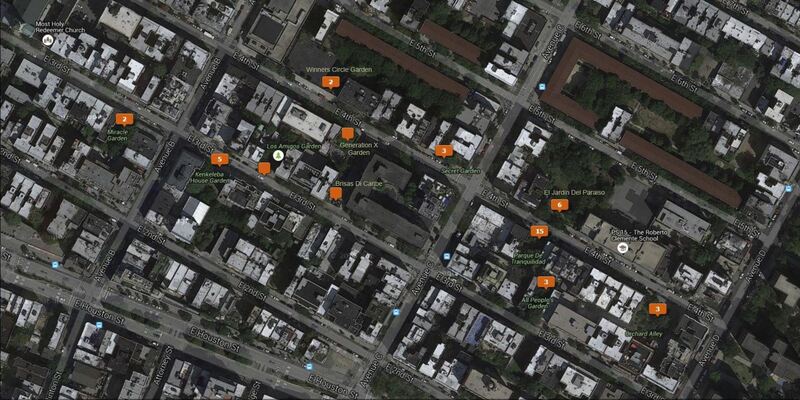 Parque De Tranquilidad at 314-318 East 4th Street between Avenues C & D and founded in 2/1/1979. Open Hours are T-F 11 am – 1:30 pm Sunday 10 am – 6 pm Tuesday. Meditation 6:30 pm – 8 pm. Parque de Tranquilidad has a strong connection to this history – one third of it sits upon the former site of the Synagogue Chevra Bikur Cholim B’nai Israel Anshei Baranov (built in 1887), which collapsed during demolition of nearby fire-damaged buildings during the economic plight of the 1970’s. This lovely garden shaded by mature trees, winding stone-dust paths and numerous seating opportunities. In 2004, GrowNYC worked with gardeners modify pathways for wheelchairs. The garden got a new tool shed, wood fencing, birdhouse, and flagstone entry. The garden also received extensive plantings donated by Chelsea Garden Center. The garden displays lace-cap hydrangeas, antique roses, Rose of Sharon, daylilies, etc. Transferred to the Manhattan Land Trust by TPL, which provided the garden with a permanent water supply. Orchard Alley Stretches the full width of the block bet. E. 3rd & 4th Streets between Avenues C & D. This park occupies the width of the block on a large open lot with the entrance on 4th Street. It has undergone a lot of recent rehabilitation. 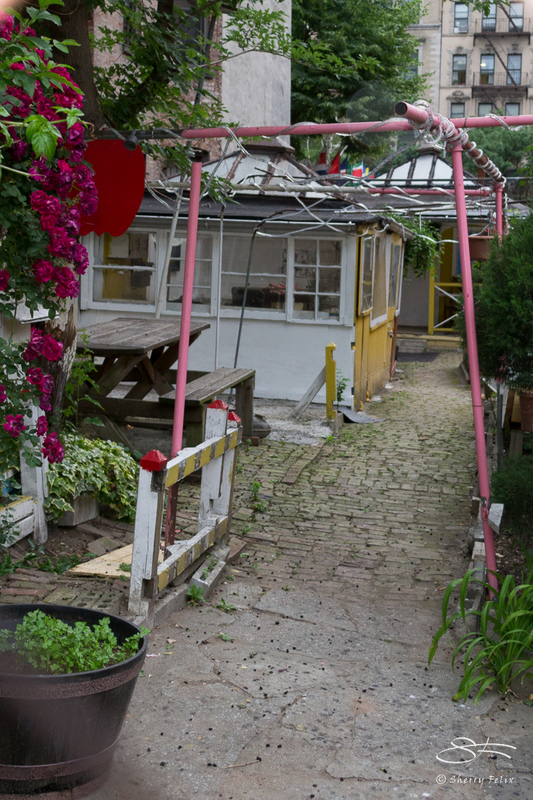 As one of the last gardens created in an extremely large lot, there was not a lot of initial optimism that it would survive the onslaught of the city’s bulldozers. Fortunately, it has survived as one of the premier horticultural gardens in the neighborhood. It has fruit trees, flowers such as alliums and tiger lilies, herbs, and winding paths. Its lot reaches East 3rd Street, but the entrance is only through East 4th. All People’s Garden 295 East 3rd Street on the north side between Avenues C & D. This garden is a Manhattan Land Trust property, and is maintained by neighborhood volunteer members. All People’s Garden, as so many others in the city was carved out of two vacant NYC owned garbage strewn, drug infested lots. This beautiful urban garden is botanical in nature, and connects the community both environmentally and culturally. By 1980 these vacant sites became a thriving green space. In 1999 under a court order secure by Eliot Spitzer the then NYS Attorney General, the garden was saved through and agreement between the City of New York and the Trust for Public Land. 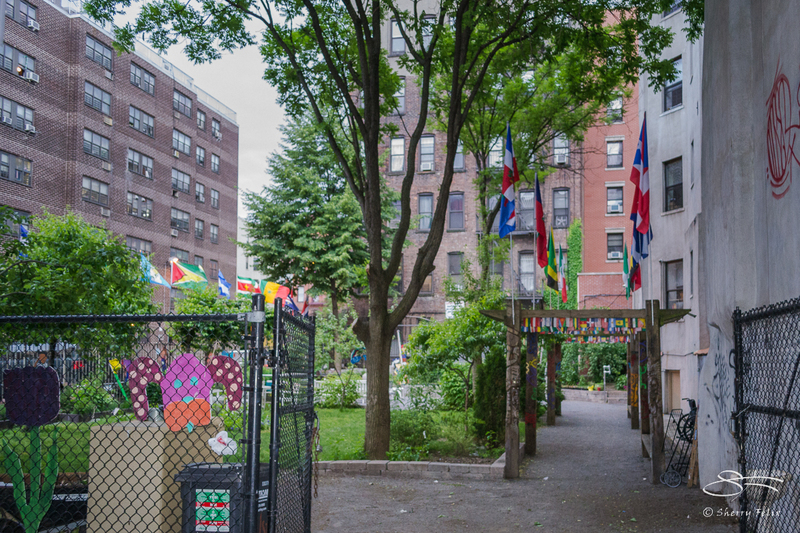 Through a grant from the Frankel Foundation and partnership with the Coalition on the Environment (GROWnyc) the garden was completely redeveloped in 2003. 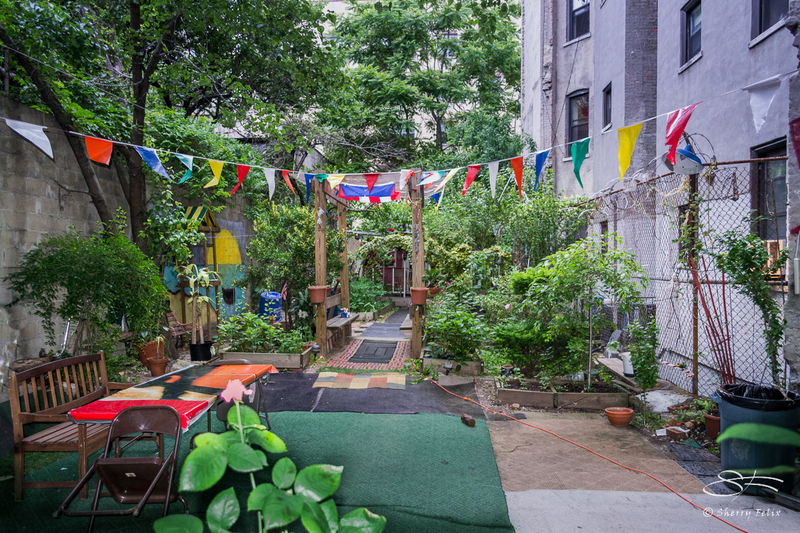 In 2004 All People’s Garden, Inc. working with TPL formed a coalition with thirteen (13) other community gardens located in Manhattan to form The Manhattan Land Trust. All People’s Garden is a private space, staff by volunteers and held in trust for the benefit of the entire community in perpetuity. Brisas Del Caribe North side of E. 3rd Street between Avenues B & C. This garden is decorated with eclectic collectables and has white picket fences along its walks and flower beds. Jardin Los Amigos Garden North side of E. 3rd Street between Avenues B & C. This garden is known for its changing seasonal and holiday installations. Kenkeleba House Garden Stretches the full width of the block between East 2nd & 3rd Streets between Avenues B & C. This park has a large outdoor sculpture yard on its north side which you can get to from East 3rd Street. Kenkeleba House Garden is the outdoor sculpture area of Kenkeleba House, an art gallery in the East Village. Entry to both the museum and the sculpture garden is free—the garden is accessible to the public whenever the gate is open (the official hours are Thursday and Friday, 10:30am–6:30pm; Saturday, 10am–4pm). The sculptures include pieces from local artists and, on occasion, visitors can catch live music in the garden. Kenkeleba Garden, named for an African healing plant. Densely forested greenery around to the back leads to a sculpture garden, which is only visible from 3rd Street. Large African sculptures and collections of scraps or bricolage, a specialty of the Lower East Side art scene, occupy the garden. Joe Overstreet and his wife, Corinne Jennings oversee Kenkeleba House gallery. Miracle Garden at 194-196 East 3rd Street between Avenues A & B was begun in 1983. It is a beautiful garden with a variety of plantings. The rear area of the garden is obscured from the street and is a calm, cool respite on a hot summer day. For access to the garden inquire next door at Mama’s Restaurant. A winding path leads visitors past with a variety of plantings, a picnic table, benches, and ornamentals, and opens into a meeting area obscured from the street, making it a calm, cool respite on a hot summer day. The rear part of the garden also includes a gazebo/stage area, a tool shed, rainwater harvesting system, and plenty of seating.